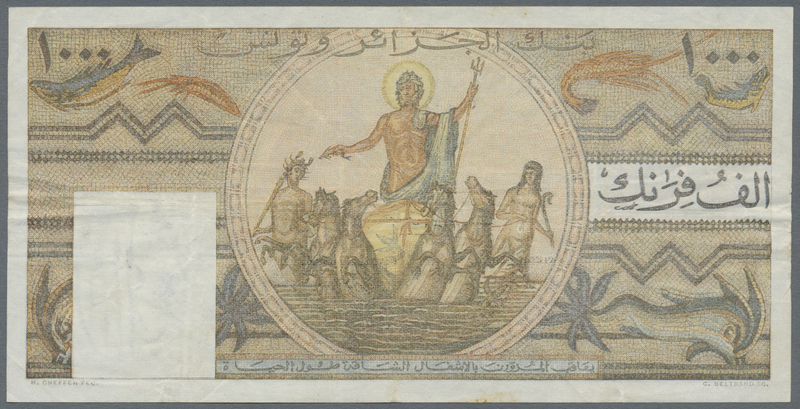 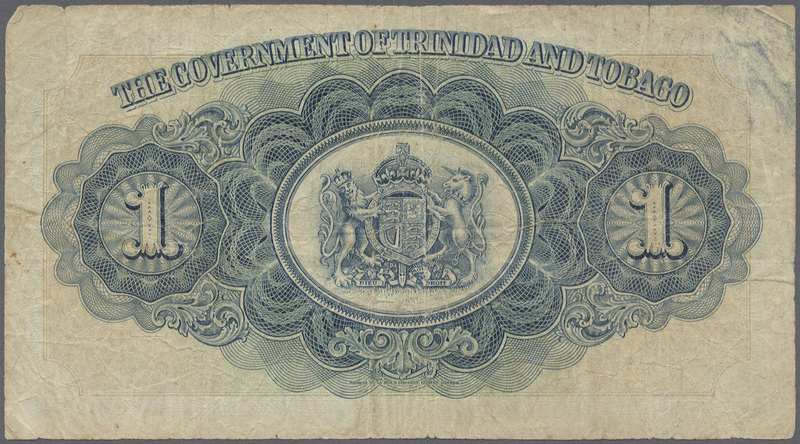 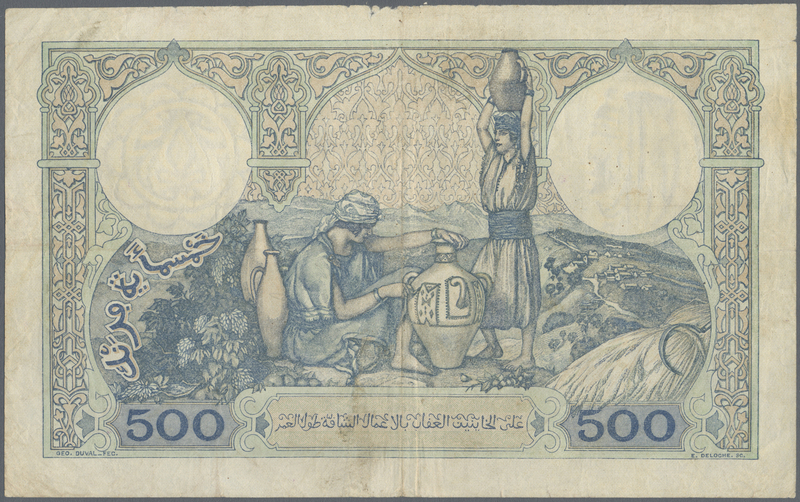 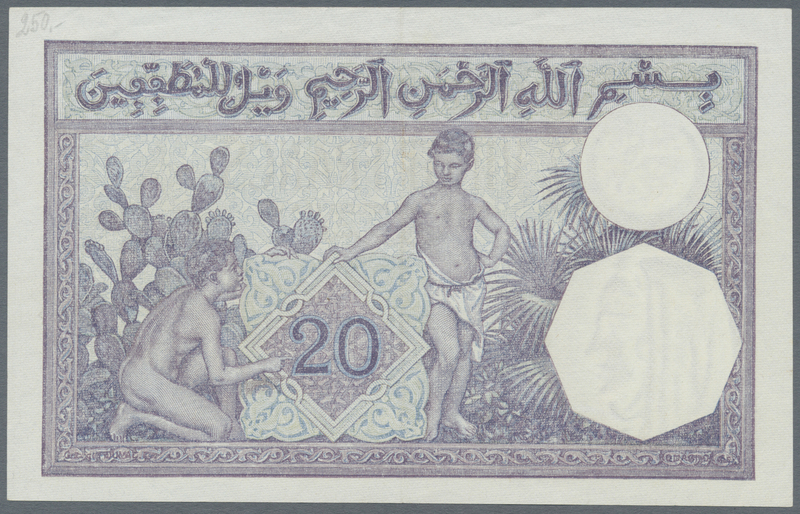 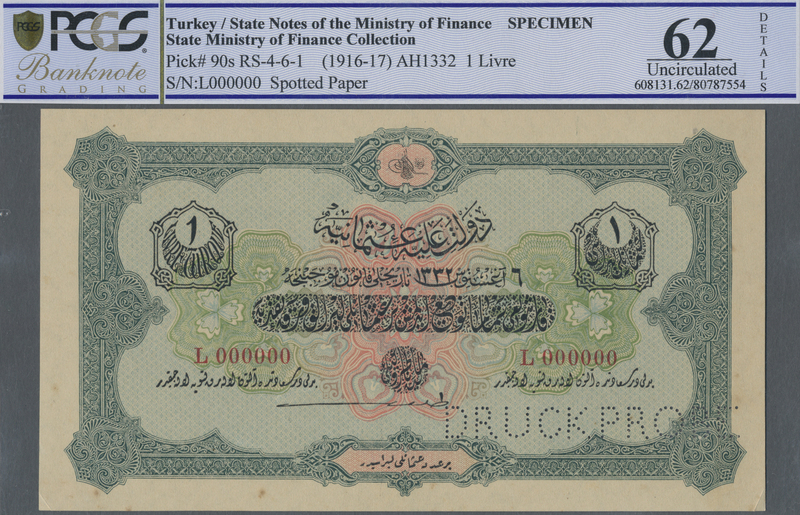 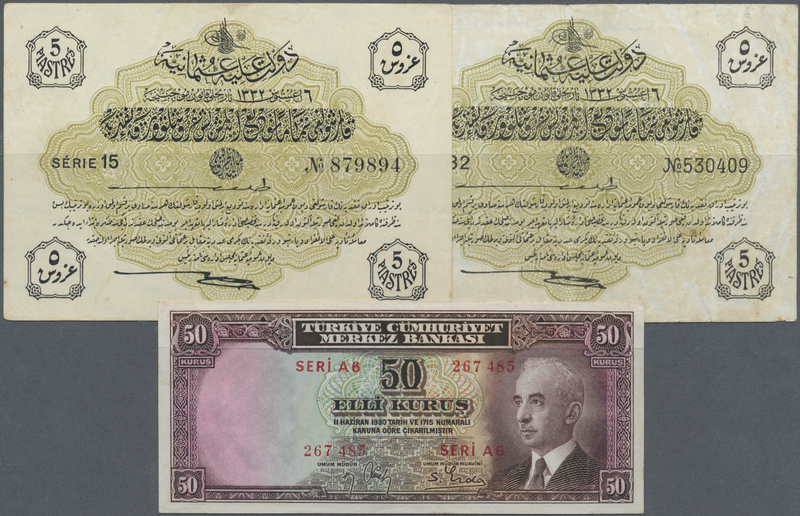 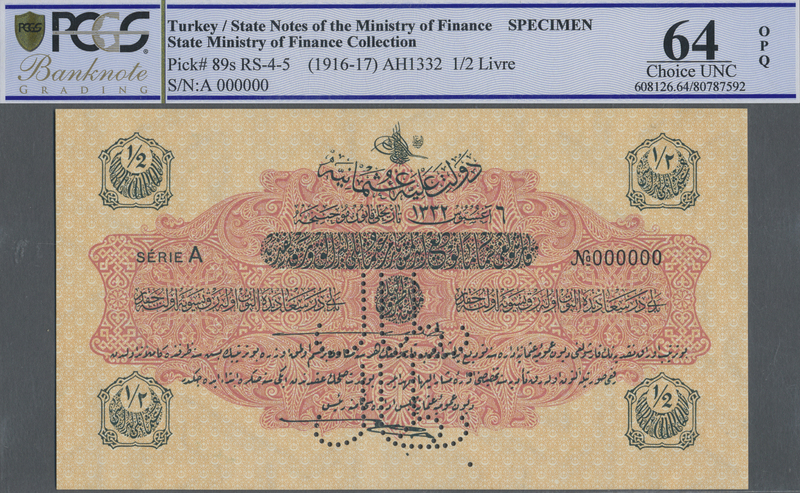 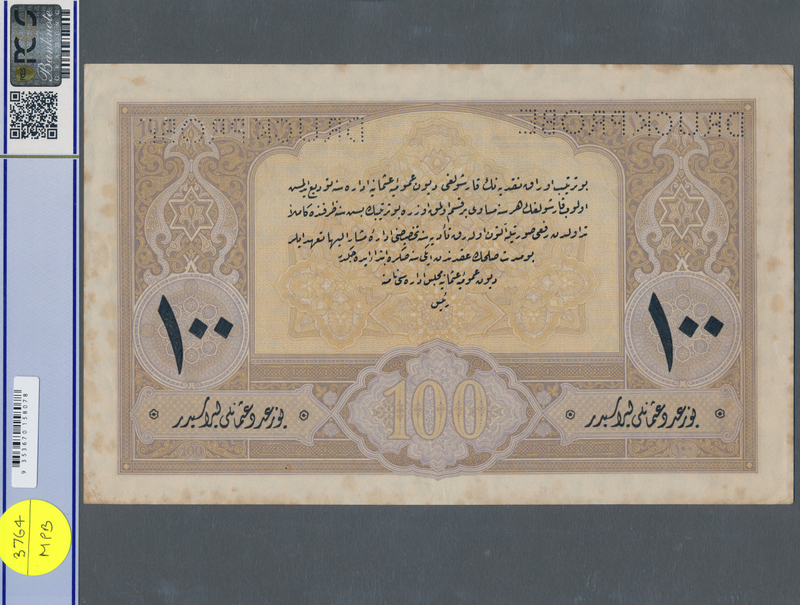 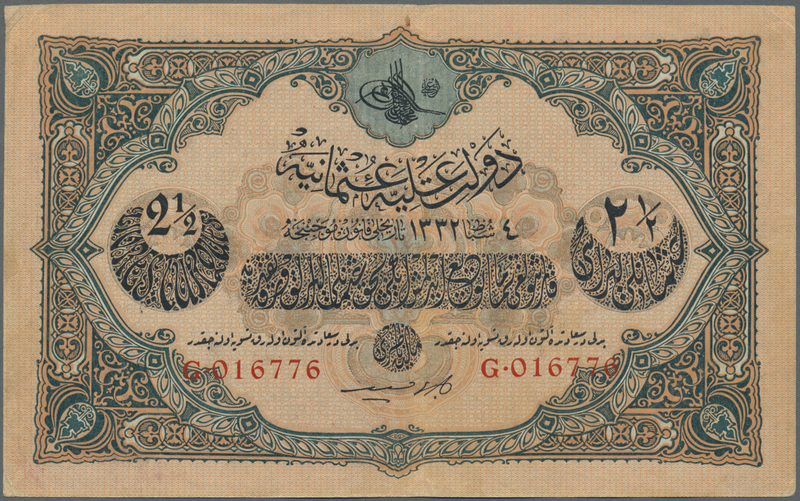 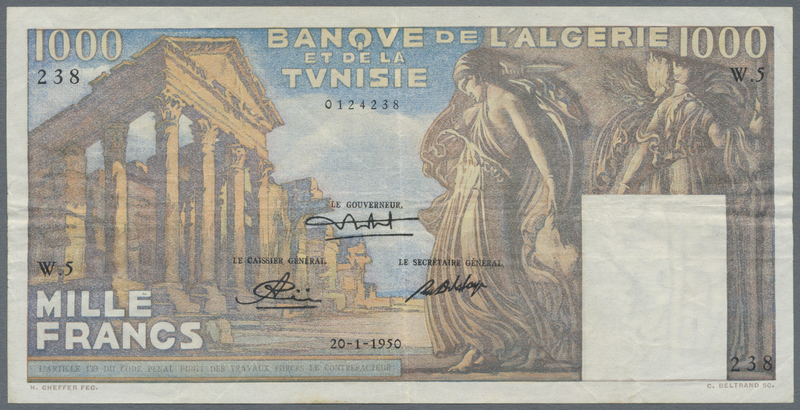 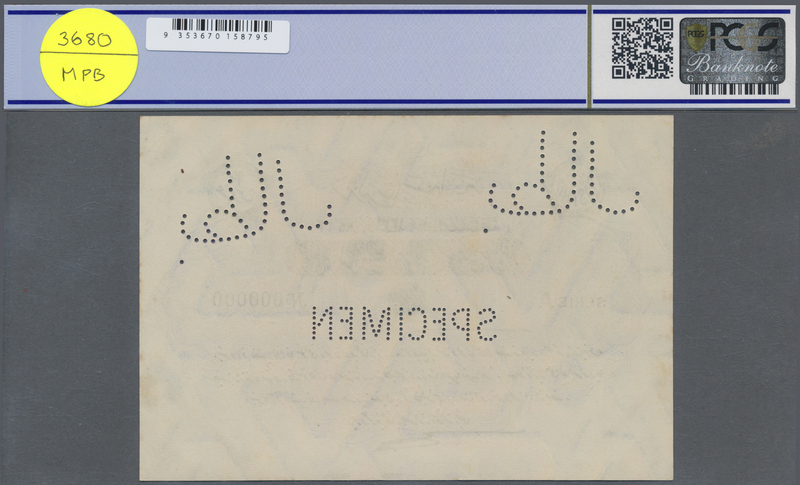 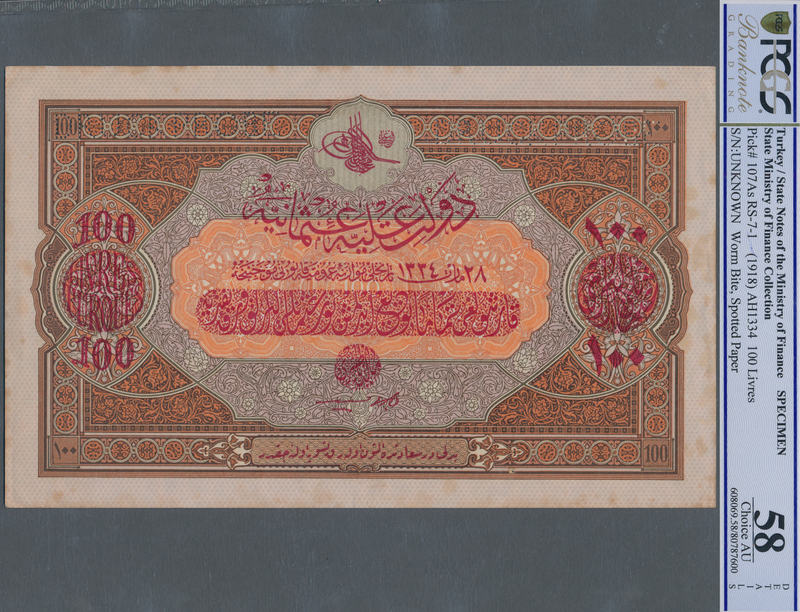 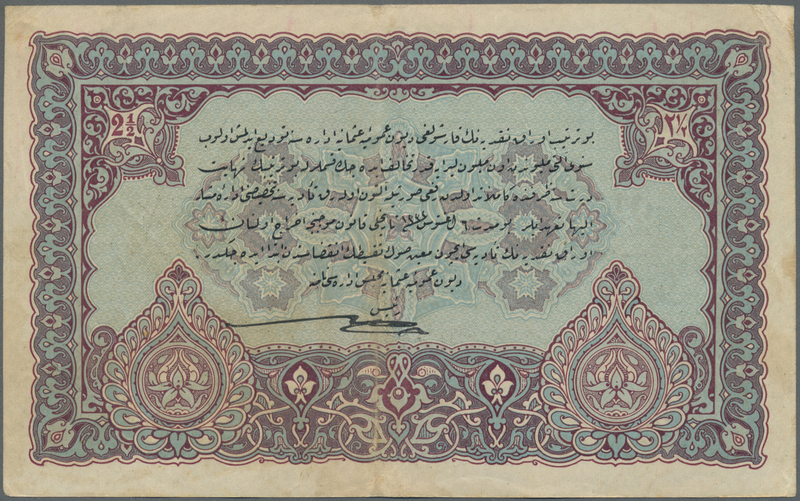 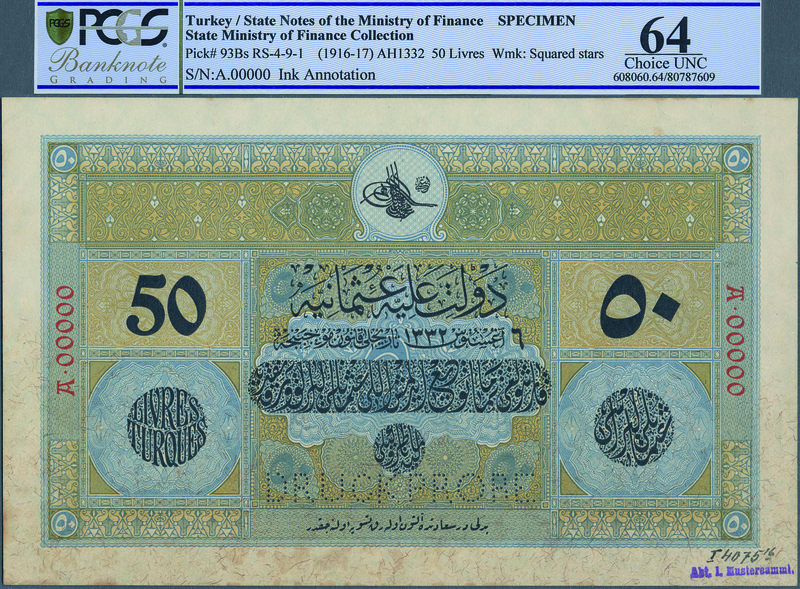 2439 Pick 70 1 Dinar 1973 P. 70, very rare with very low serial number A/1 000098, banknote from the first bundle ever produced for this type of note, in crisp original condition: UNC. 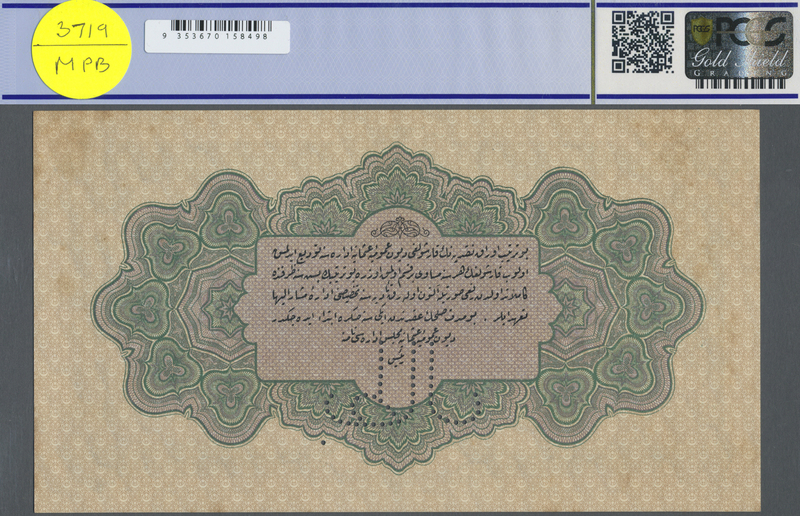 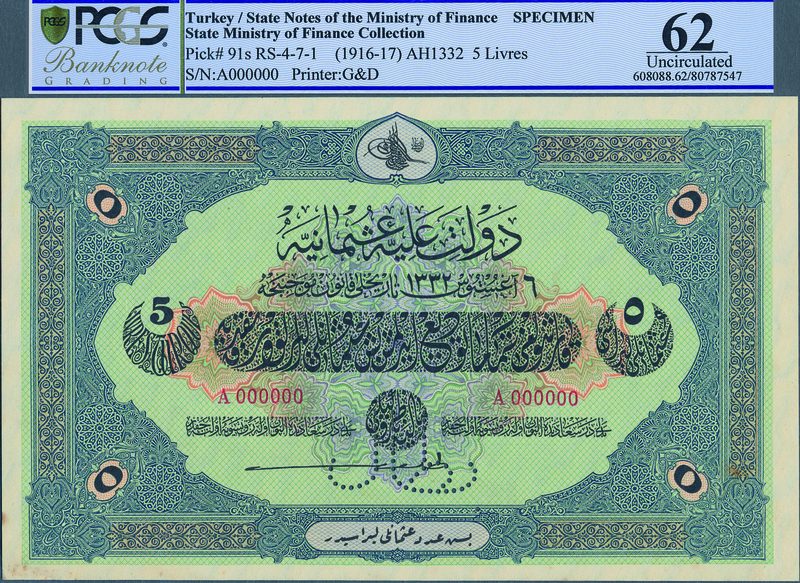 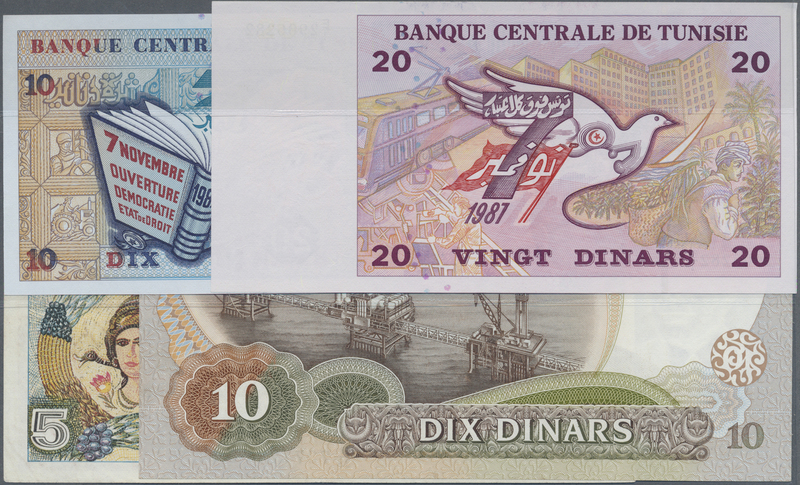 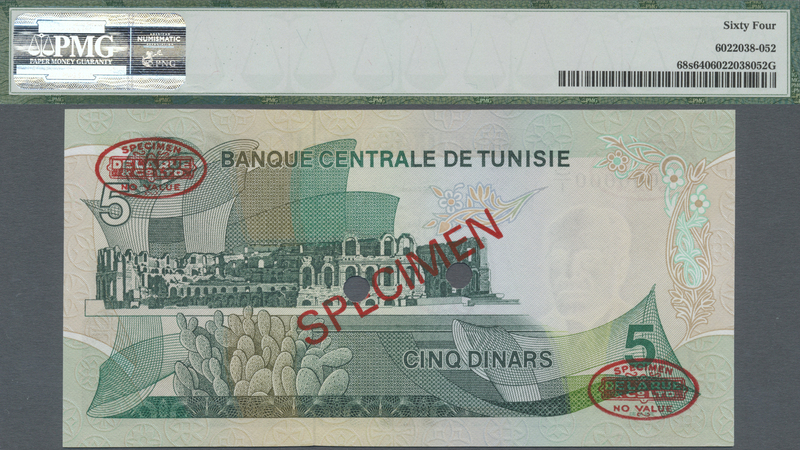 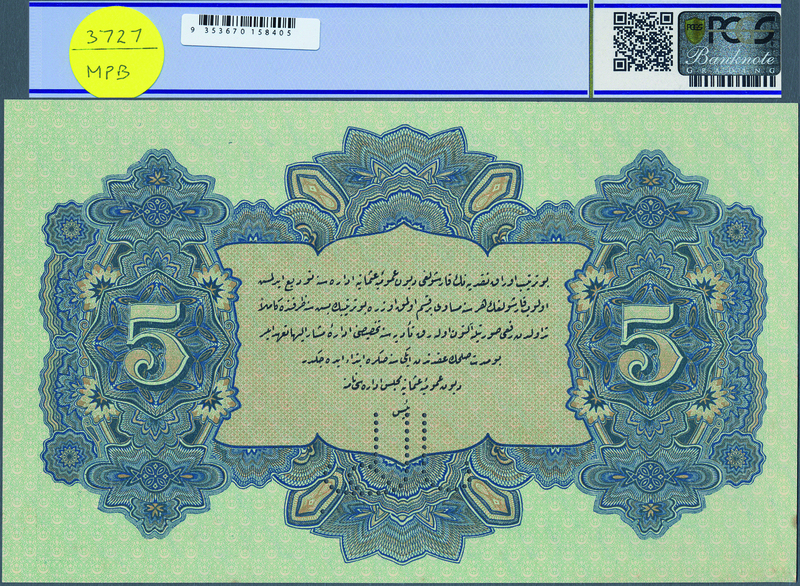 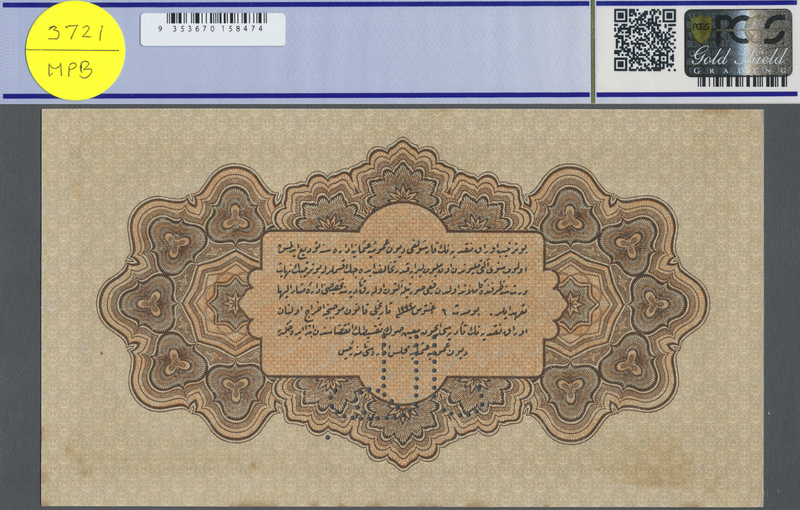 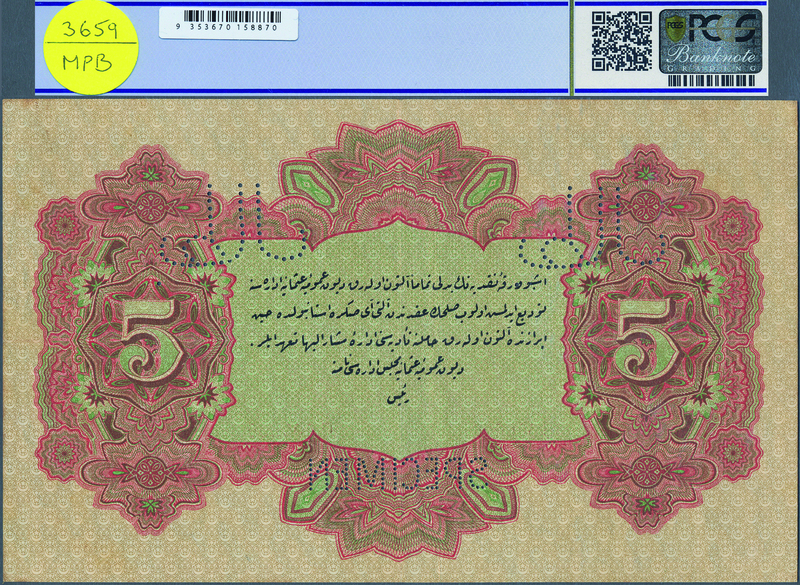 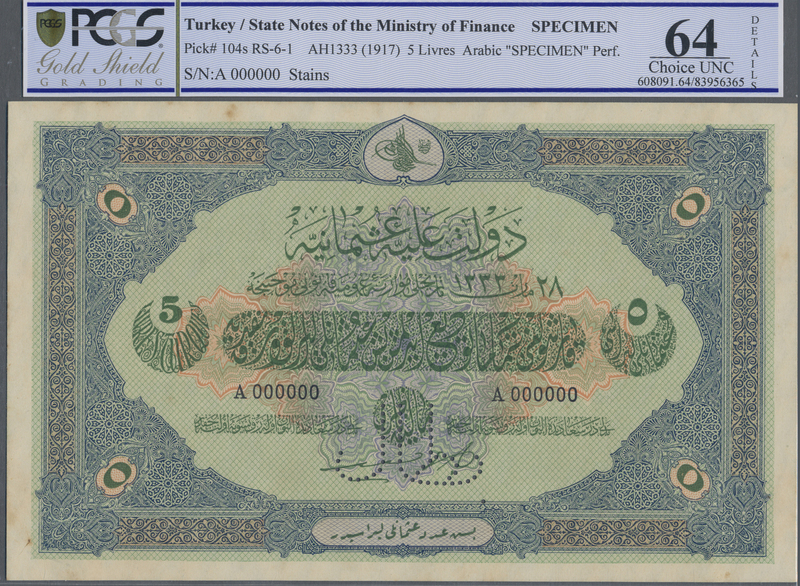 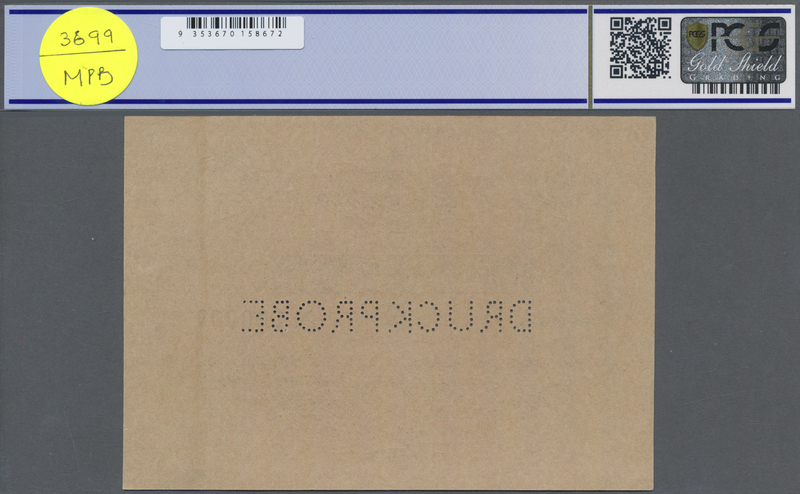 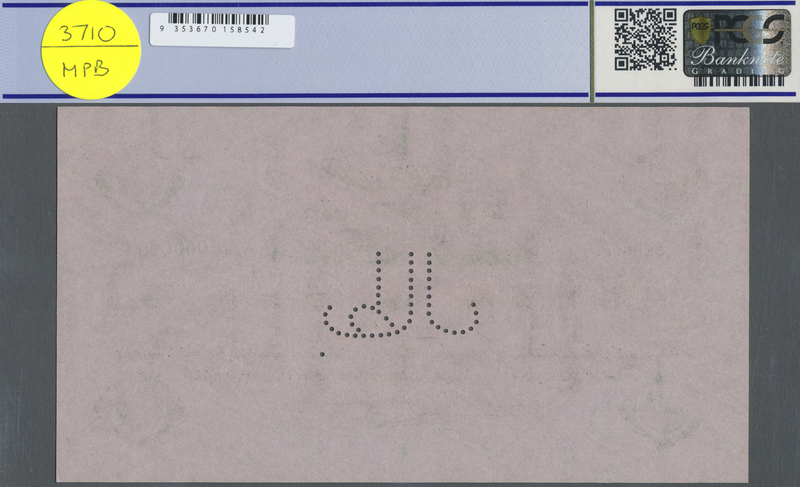 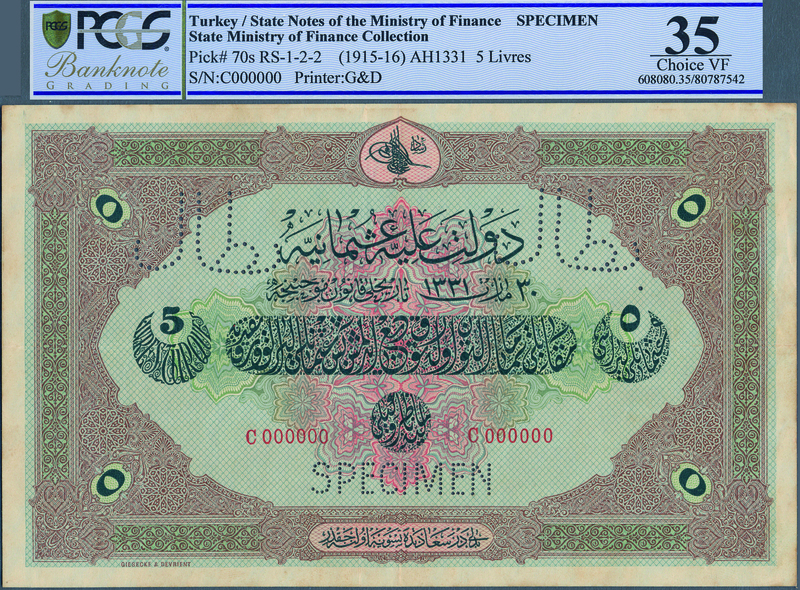 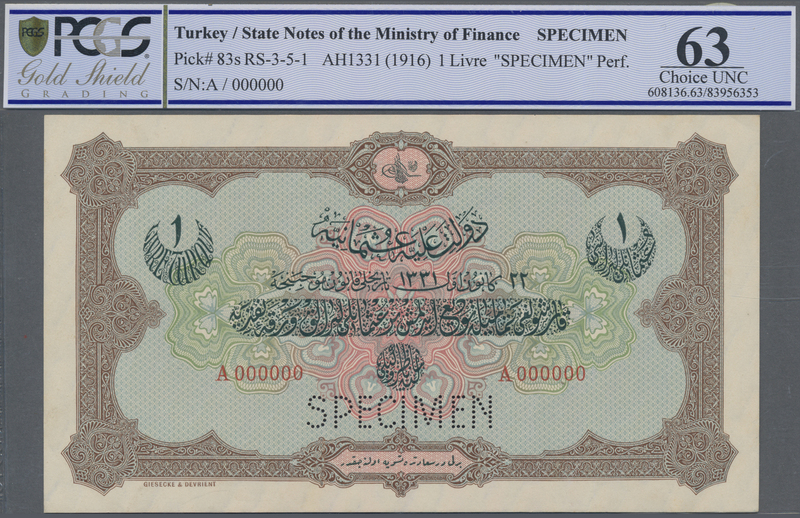 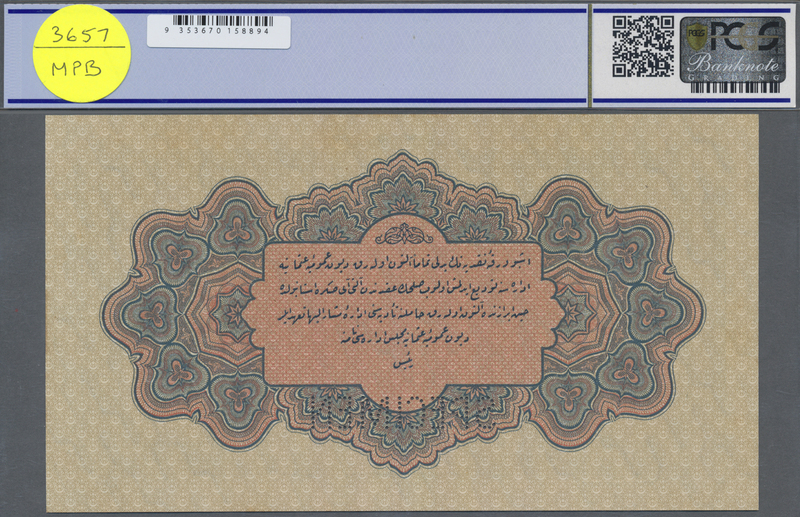 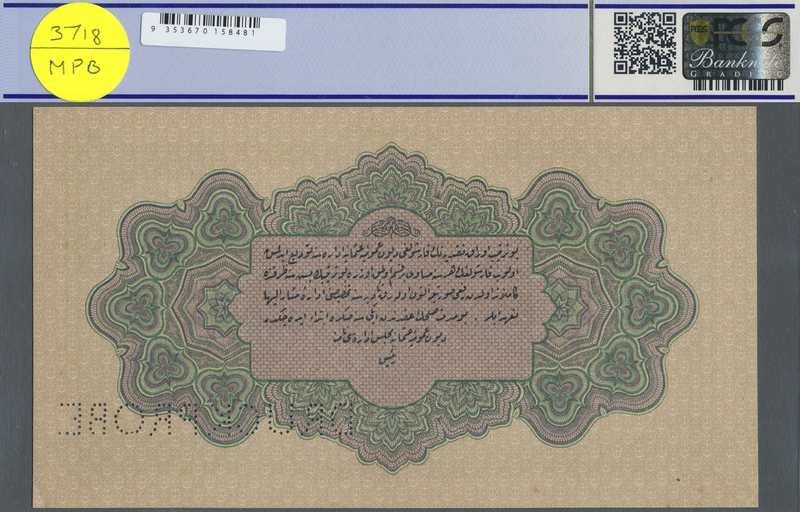 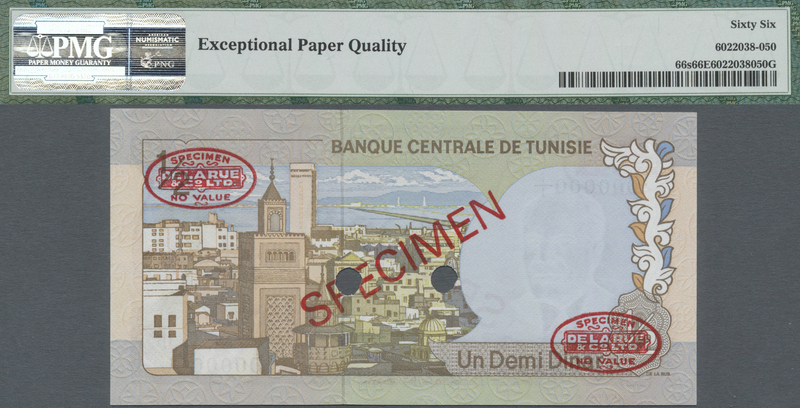 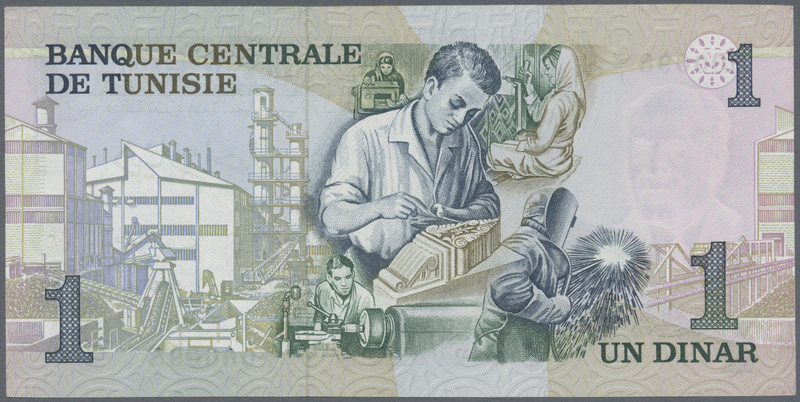 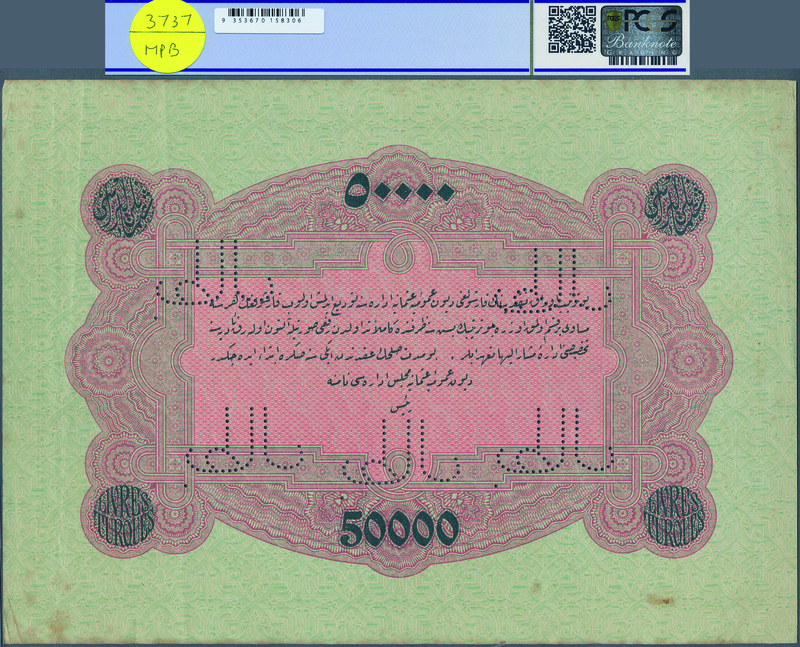 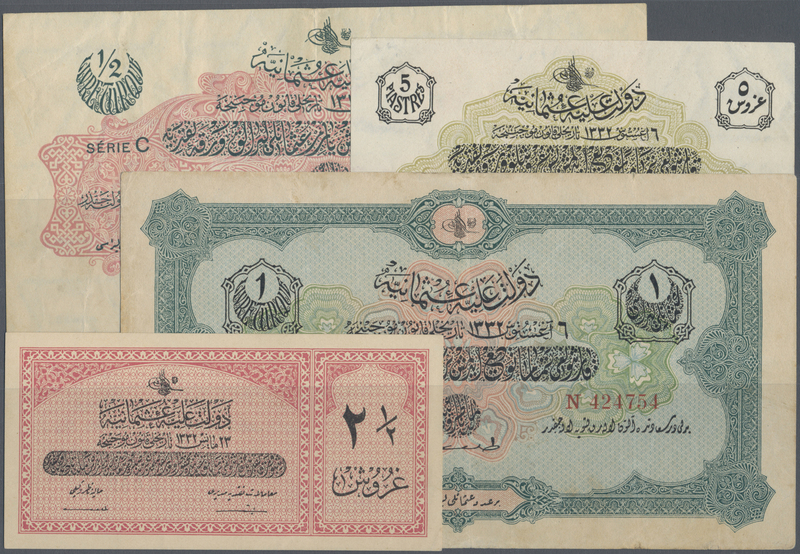 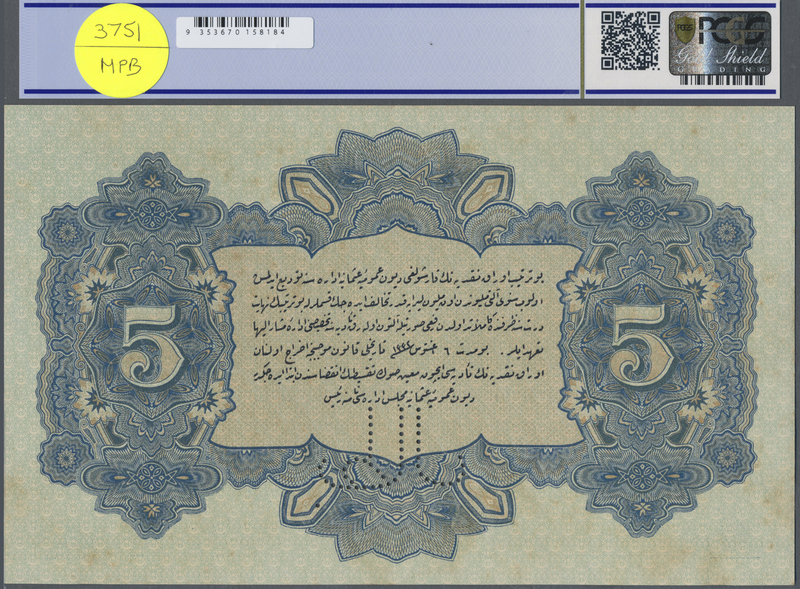 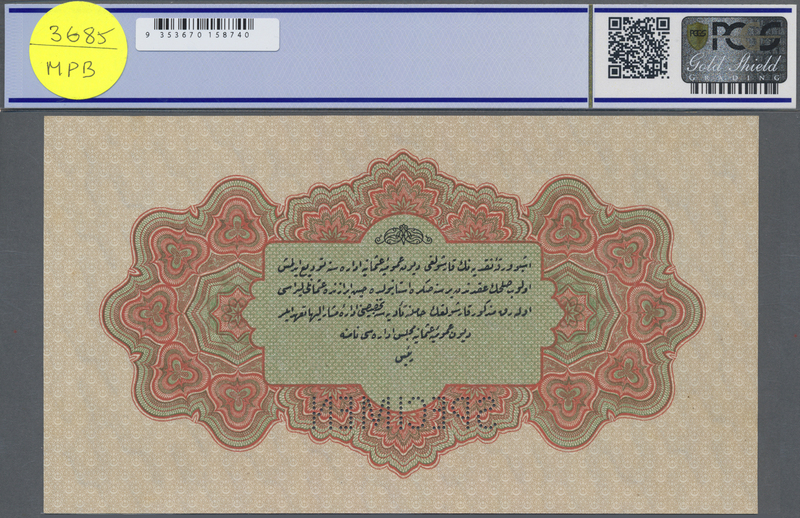 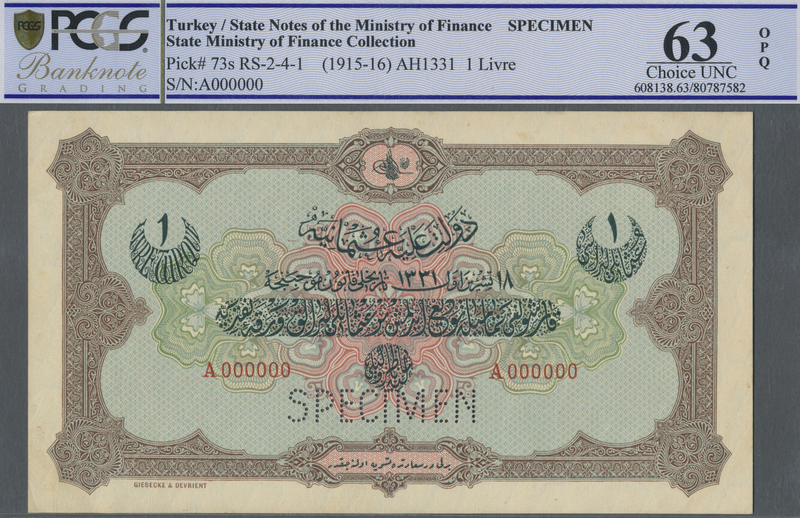 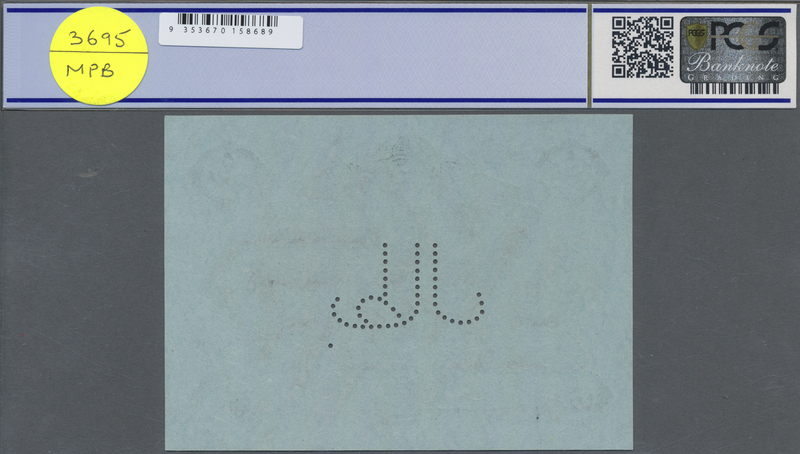 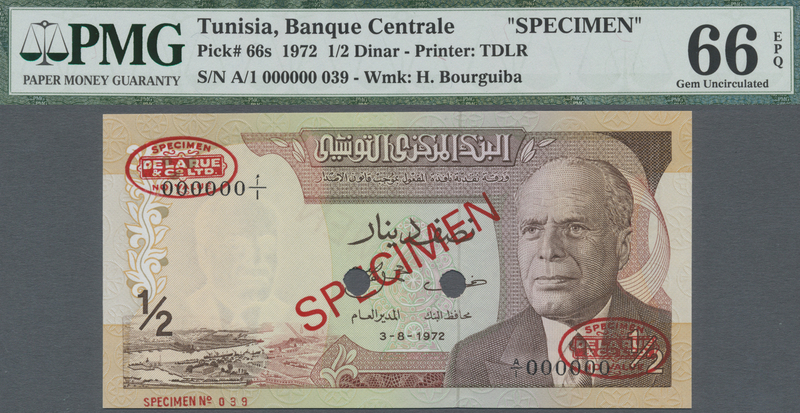 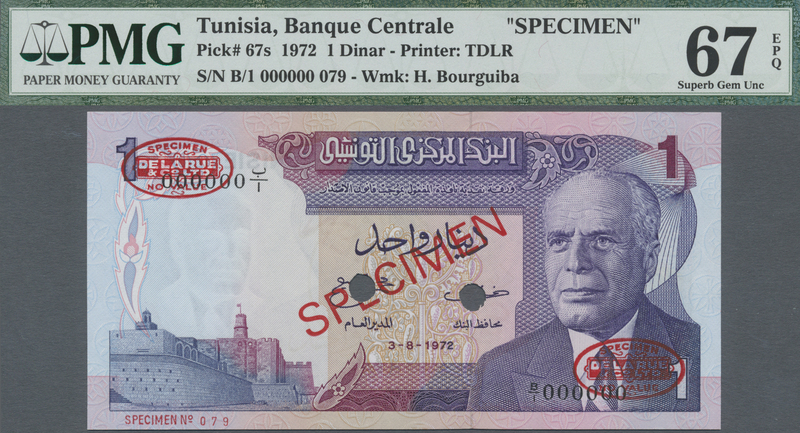 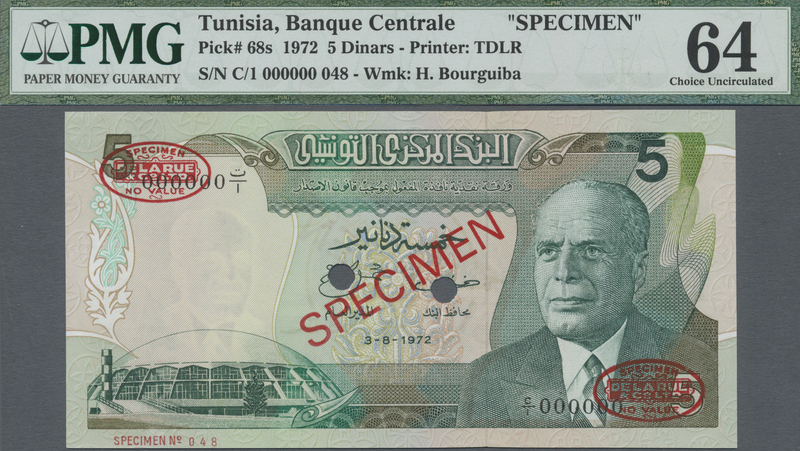 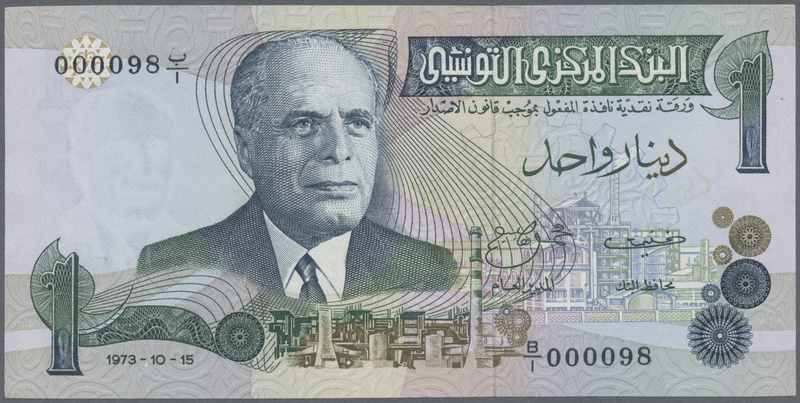 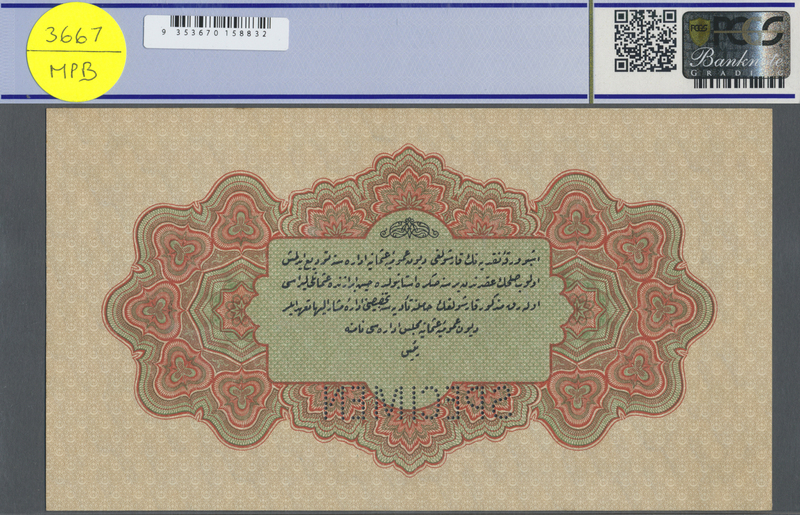 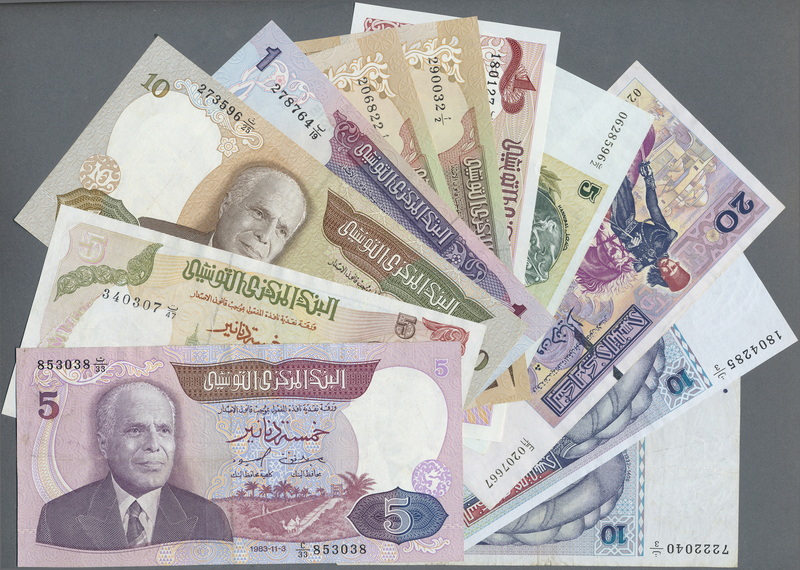 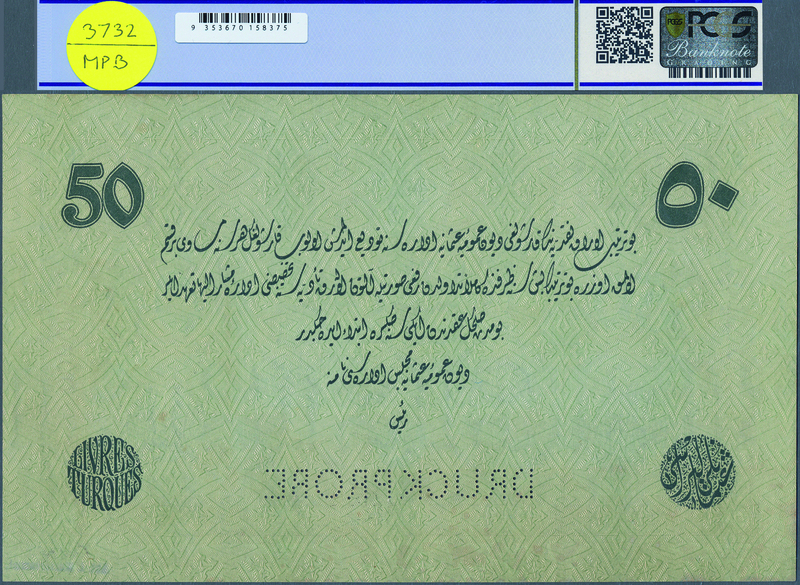 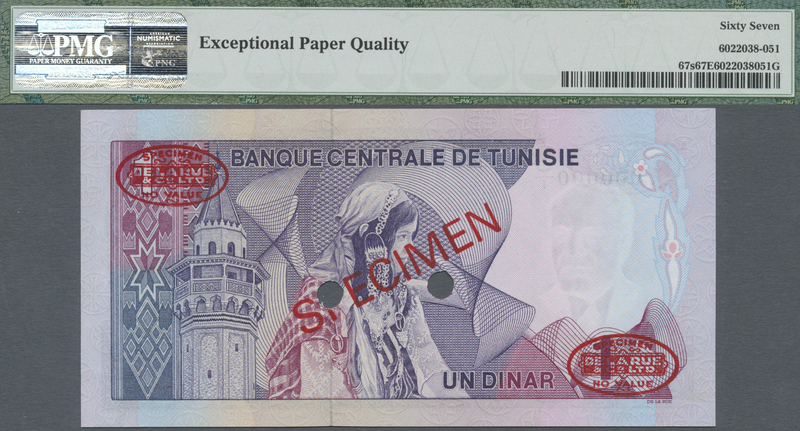 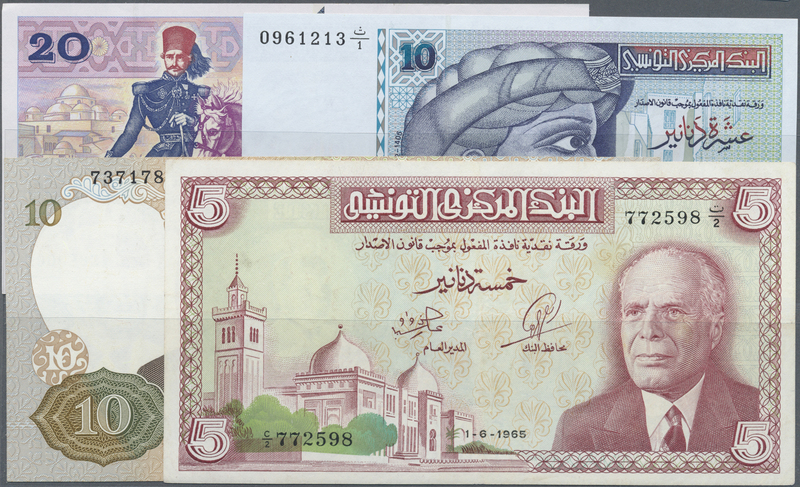 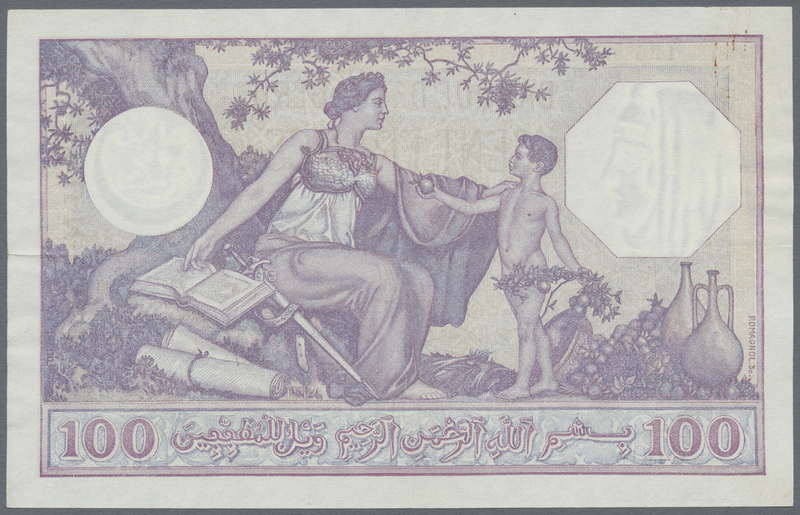 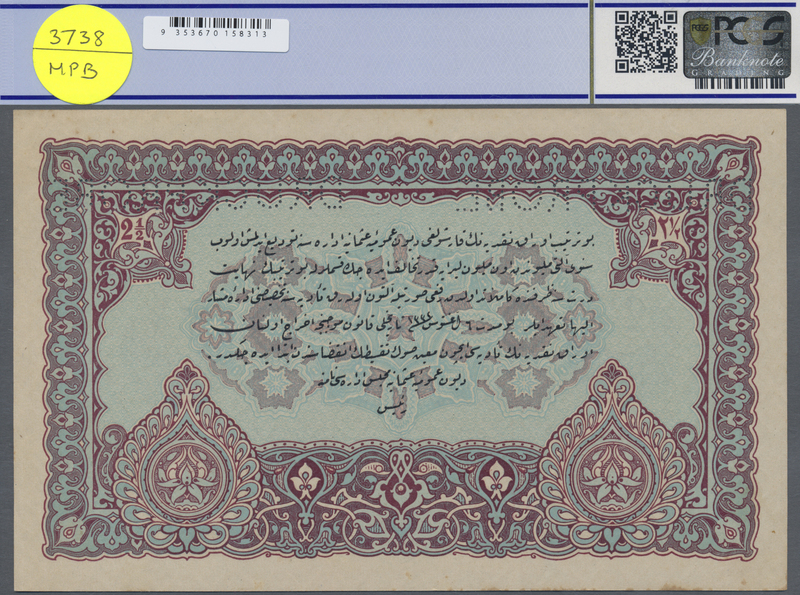 2441 Pick diverse set of 15 banknotes containing 5 Dinars 1993, 3x 10 Dinars 1994, 2x 20 Dinars 1992,1 Dinar 1980, 5 Dinars 1965, 2x 1/2 Dinar 1972, 1 Dinar 1972, 2x 10 Dinars 1986, 5 Dinars 1980, 5 Dinars 1983, P. 79, 75, 84, 67, 66, 64, 74, 88, 87A, 86, mostly XF to aUNC condition, a few in VF included, all with strong paper and original colors, nice set. 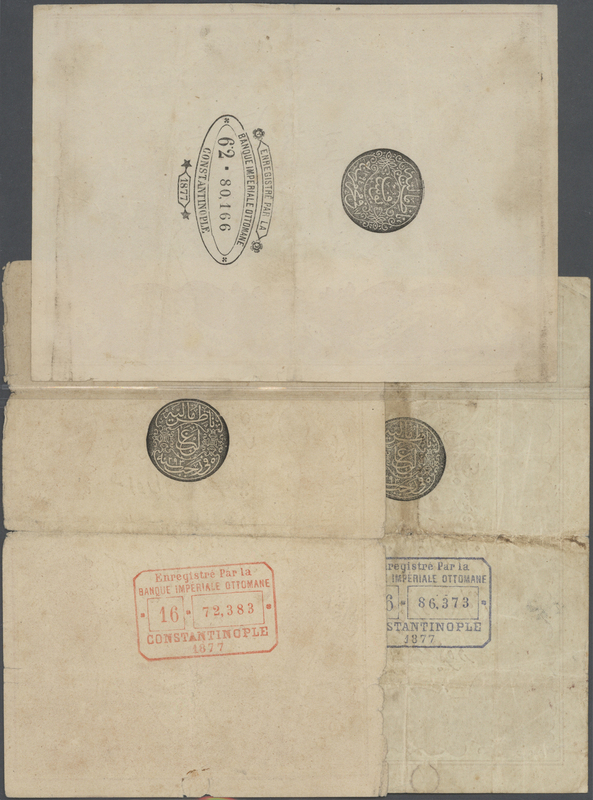 (15 pcs). 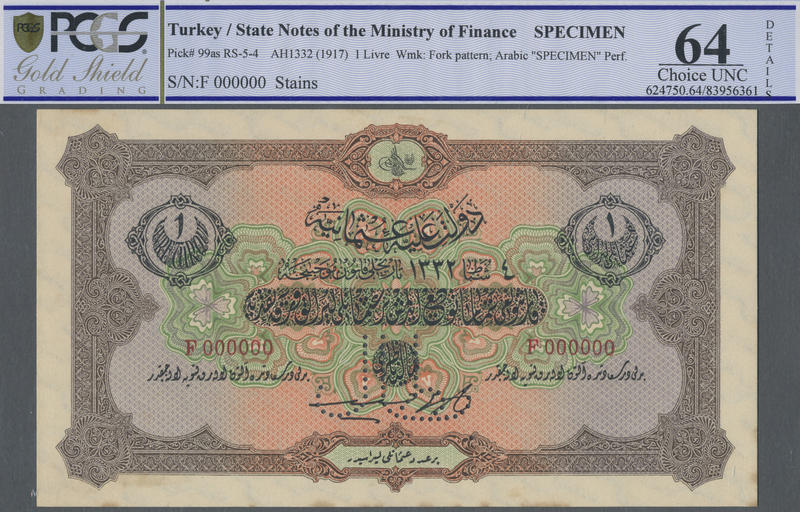 2446 Pick 69s 1 Livre ND(1915-16) Specimen P. 69s with zero serial numbers and Specimen perforation in condition: PCGS graded 64 Choice UNC. 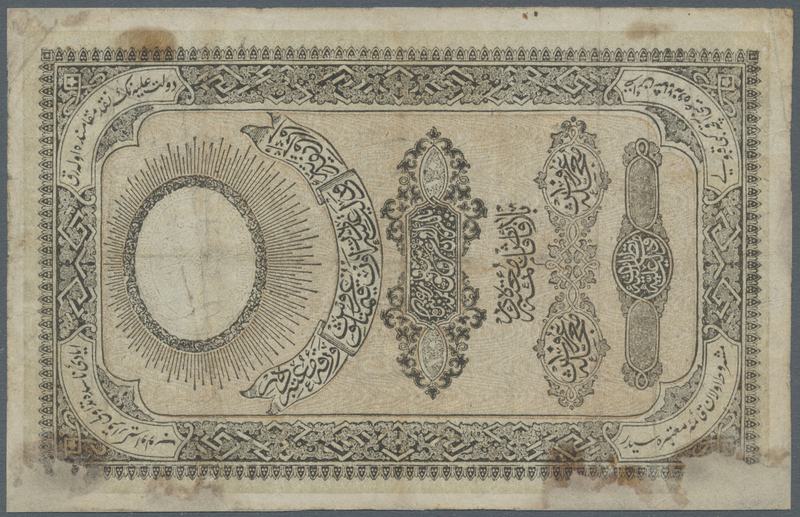 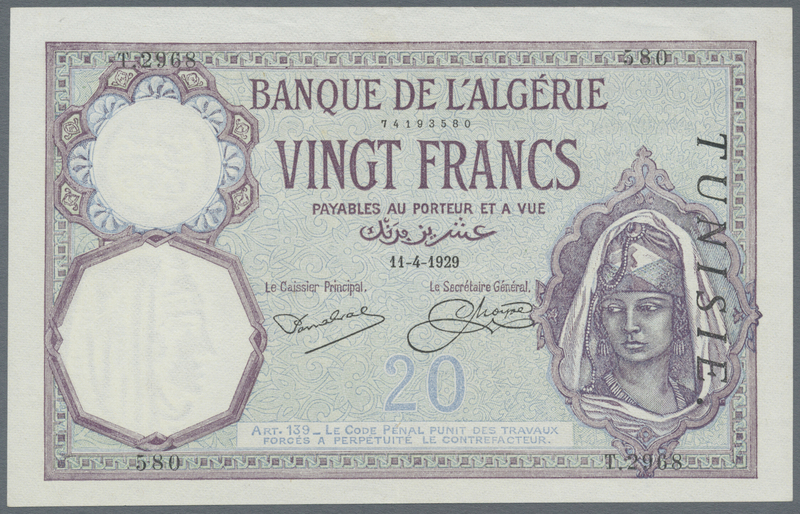 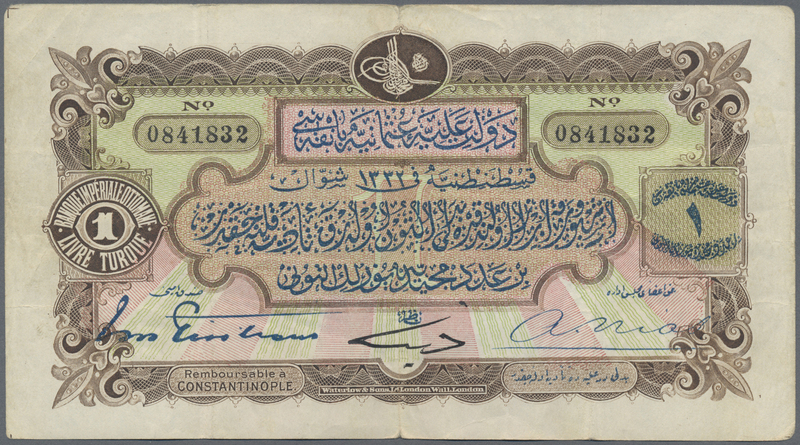 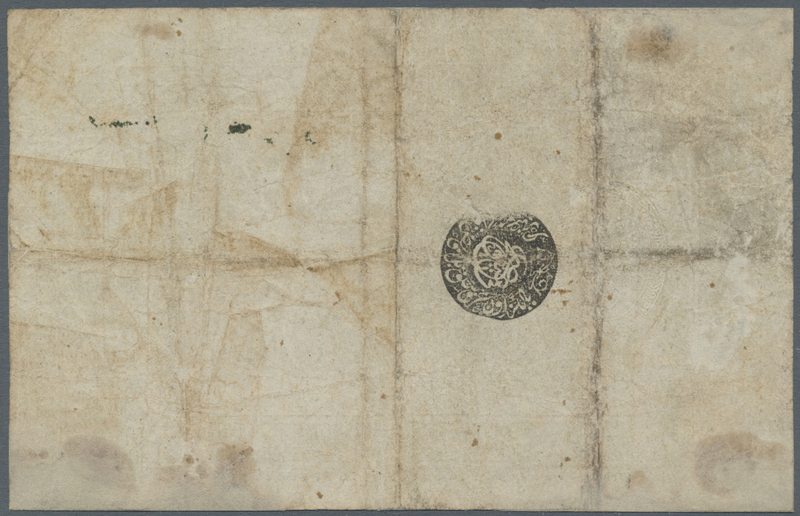 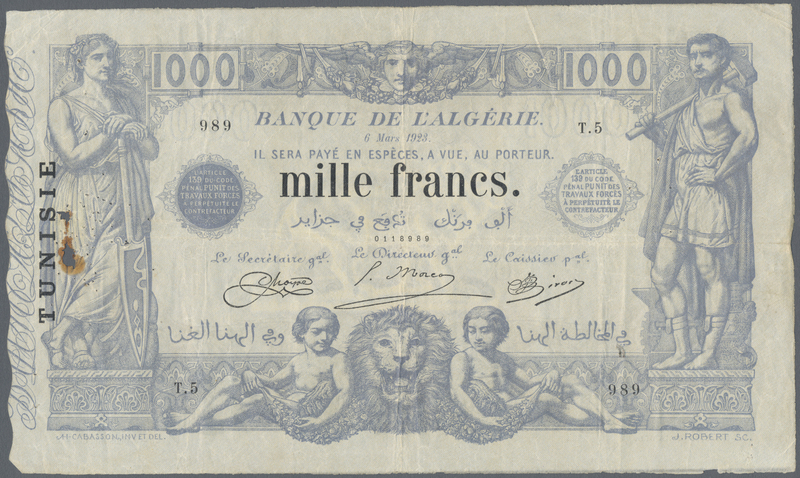 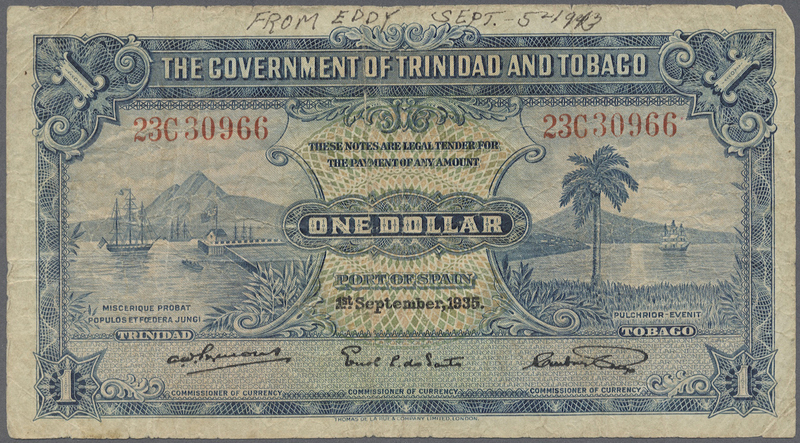 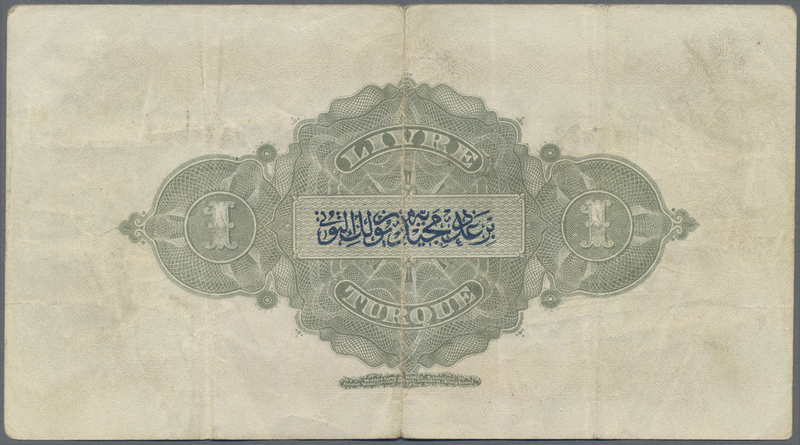 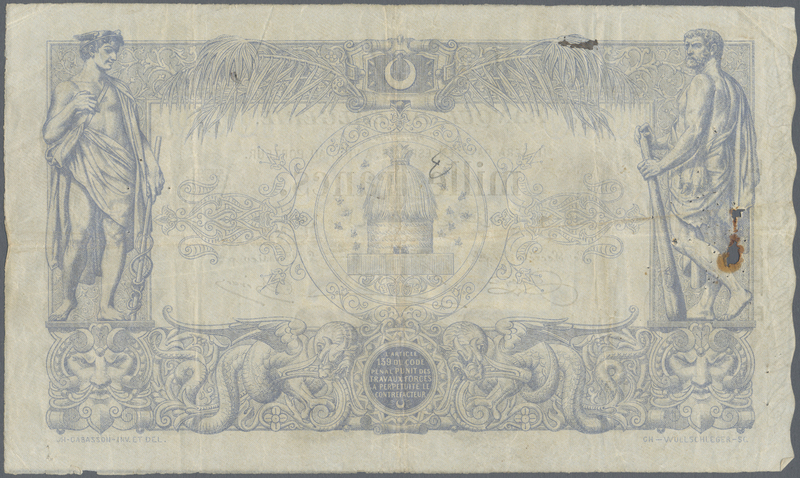 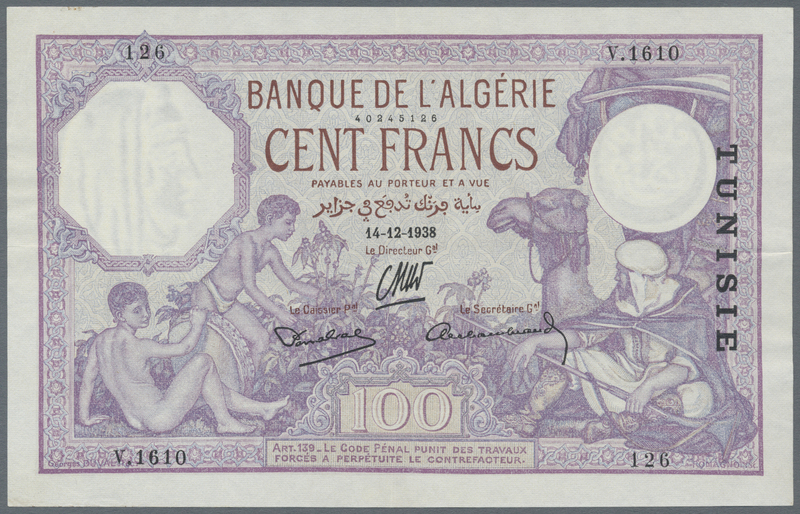 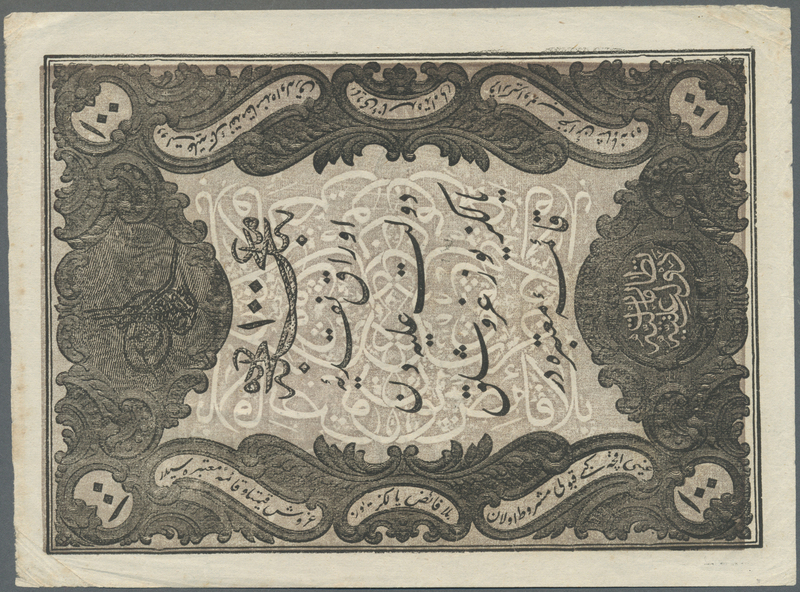 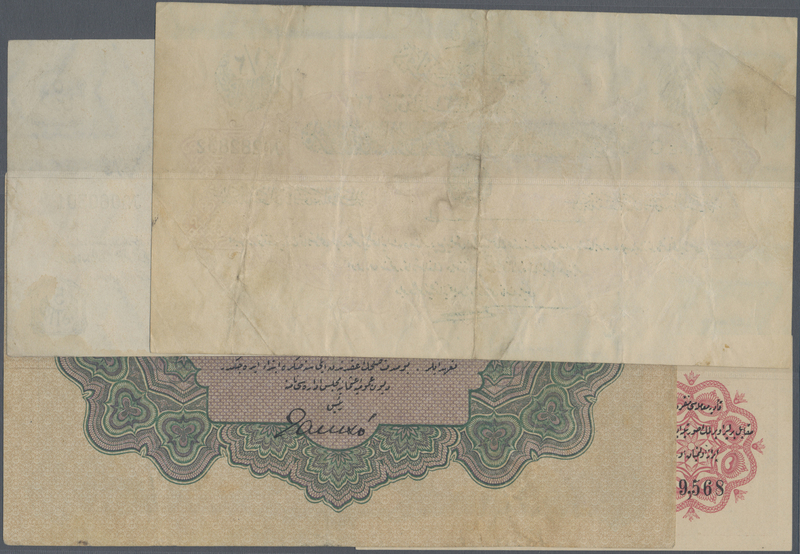 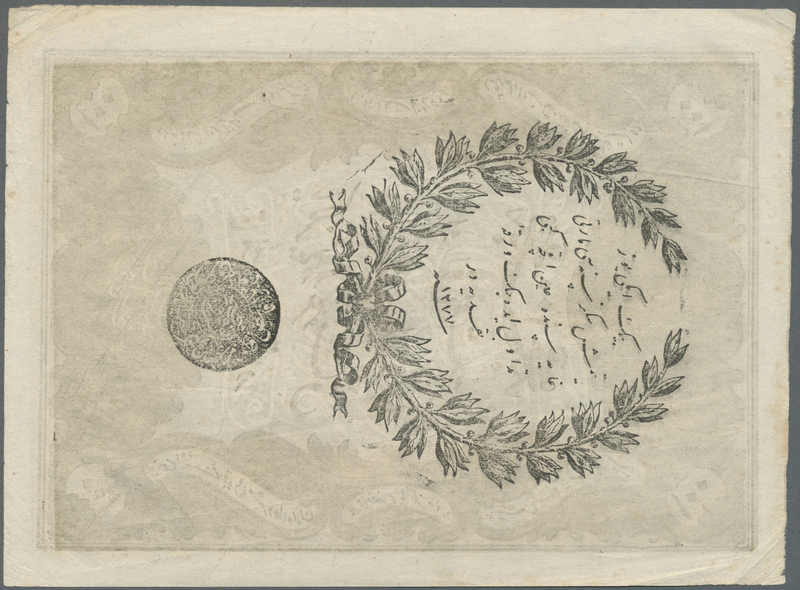 2447 Pick 70s Rare Specimen banknote of 5 Livres ND(1915-16) AH1331, RS-1-2-2, with arablic specimen perforation, western specimen perforation and zero serial numbers, ligh stains at borders, light horizontal and vertical folds, bright original colors, condition: PCGS graded 35 Choice VF. 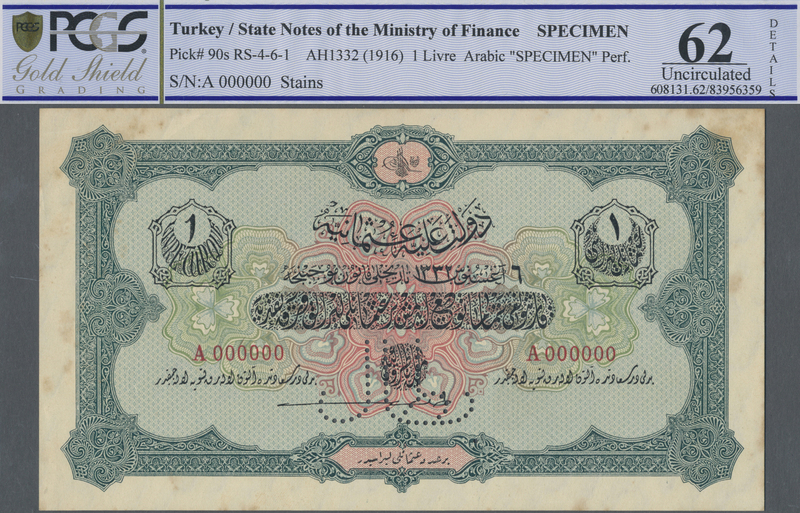 2448 Pick 71s 1/4 Livre ND(1915) Specimen P. 71s, rare note in condition: PCGS graded 64 Choice UNC. 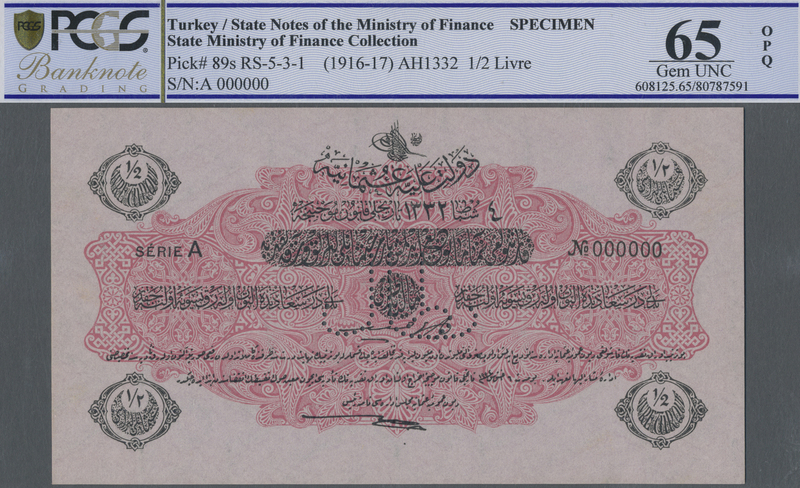 2449 Pick 73s 1 Livre ND(1915-16) Specimen P. 73s in condition: PCGS graded 63 Choice UNC OPQ. 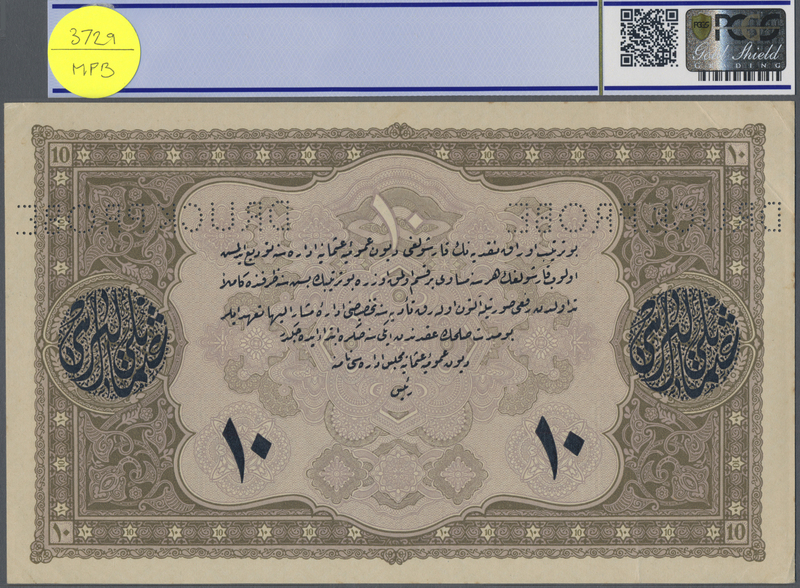 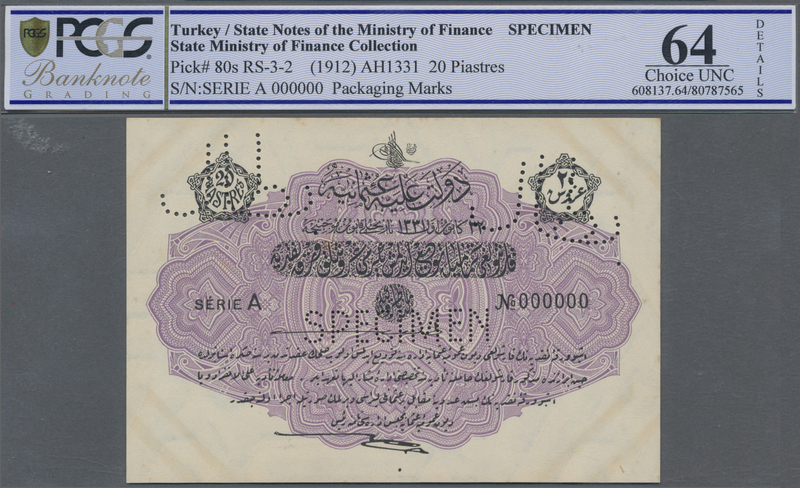 2450 Pick 80s 20 Piastres ND(1912) Specimen P. 80s in condition: PCGS graded 64 Choice UNC. 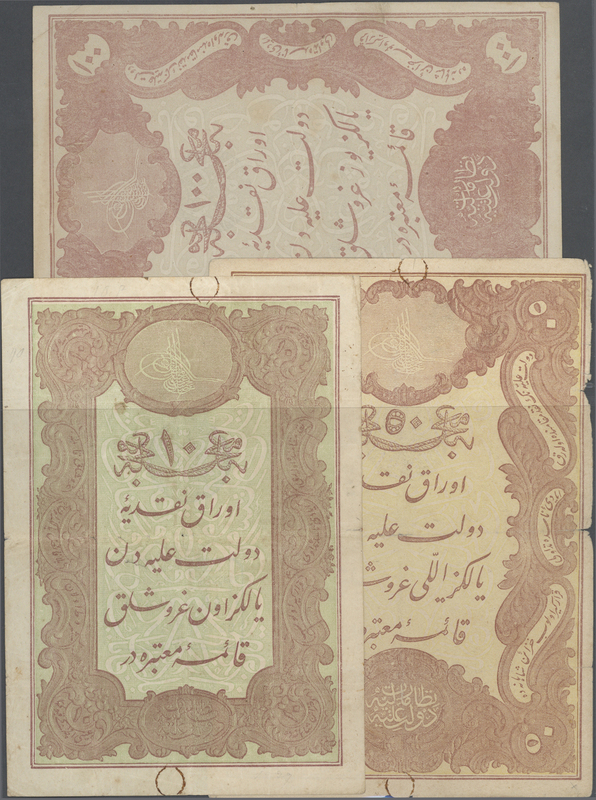 2452 Pick 83s 1 Livre ND(1916) Specimen P. 83s with zero serial numbers and specimen perforation in condition: PCGS graded 63 Choice UNC. 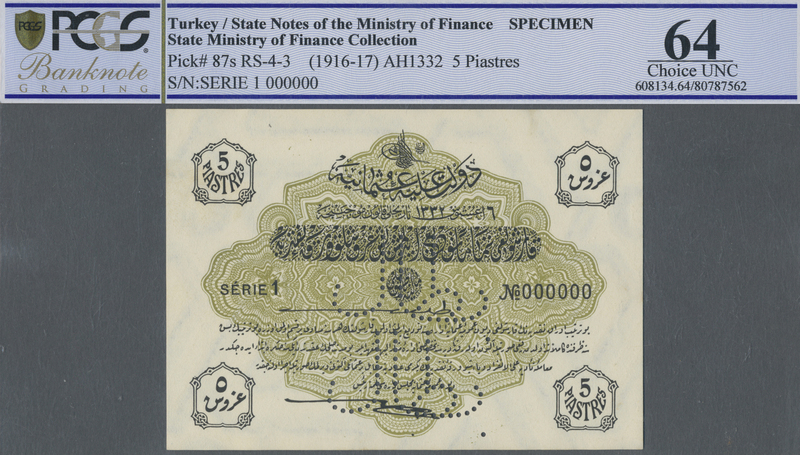 2454 Pick 87s 5 Piastres ND(1916-17) Specimen P. 87s with zero serial numbers and specimen perforation in condition: PCGS graded 65 GEM UNC OPQ. 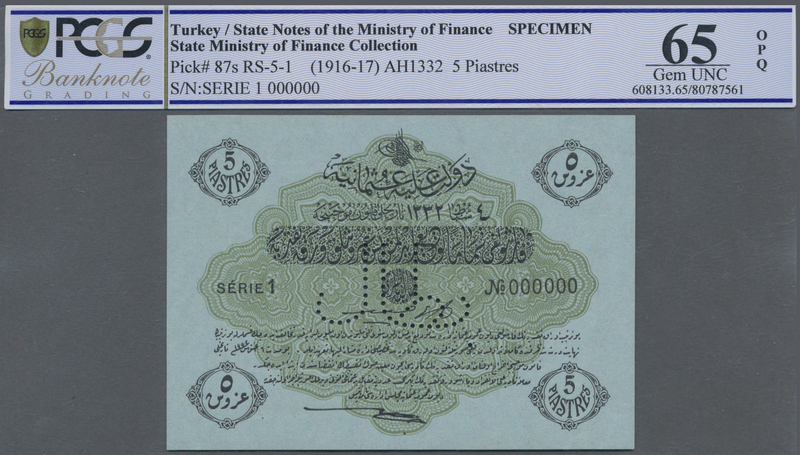 2455 Pick 87s 5 Piastres ND(1916-17) Specimen P. 87s in condition: PCGS graded 64 Choice UNC. 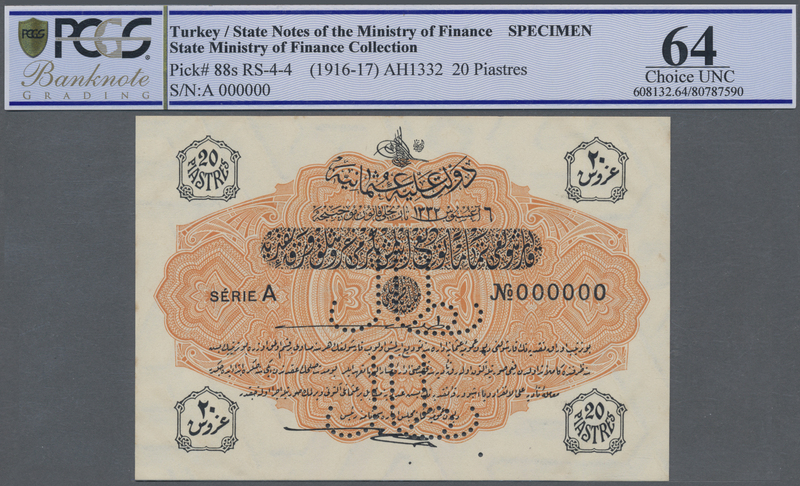 2456 Pick 88s 20 Piastres ND(1916-17) Specimen P. 88s RS-4-4, with zero serial numbers and specimen perforation in condition: PCGS grade 64 Choice UNC. 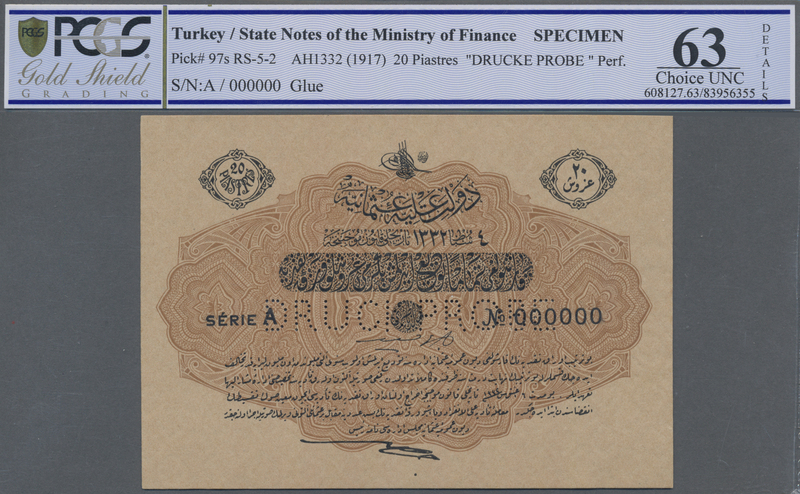 2457 Pick 88s 20 Piastres ND(1916) Specimen Druckprobe P. 88s, with zero serial numbers and Specimen perforation, rare note in condition: PCGS graded 63 Choice UNC. 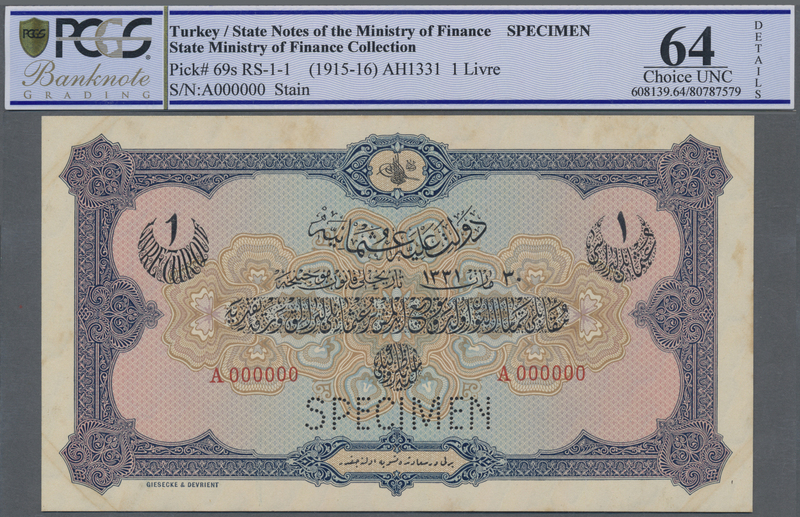 2458 Pick 89s 1/2 Livre ND(1916-17) Specimen P. 89s with zero serial numbers and Speicmen perforation in condition: PCGS graded 65 GEM UNC OPQ. 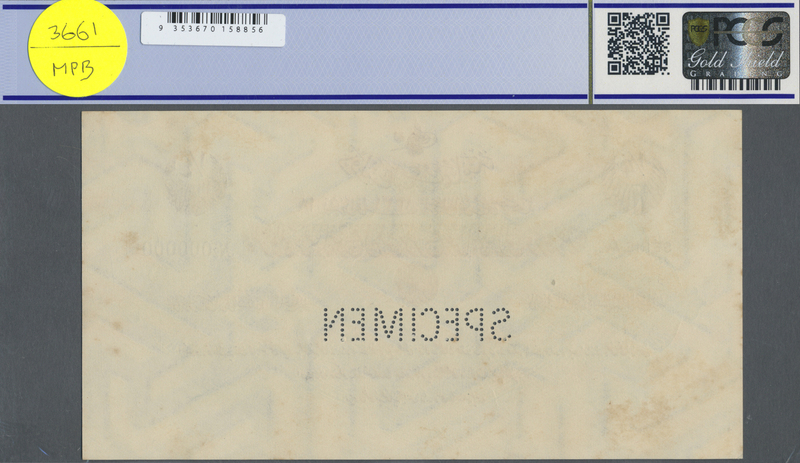 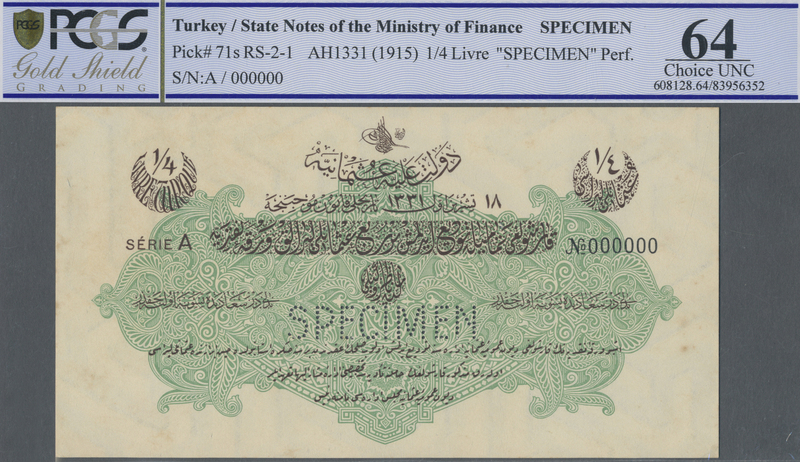 2459 Pick 89s 1/2 Livre ND(1916-17) Specimen P. 89s with zero serial numbers and specimen perforation in condition: PCGS graded 64 Choice UNC OPQ. 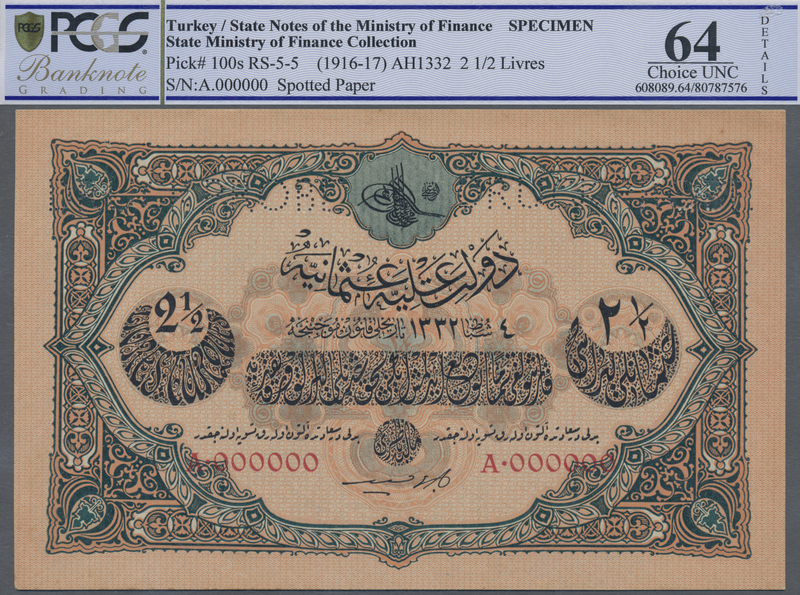 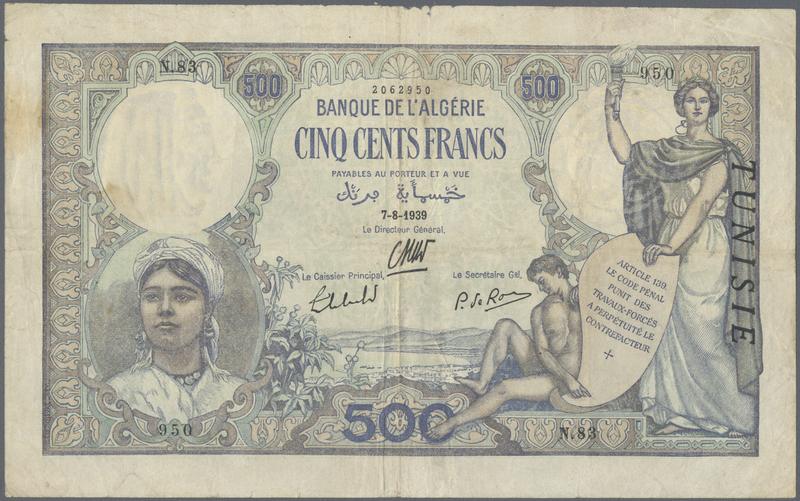 2460 Pick 90s 1 Livre ND(1916-17) Specimen P. 90s, rare note in condition: PCGS graded 62 UNC. 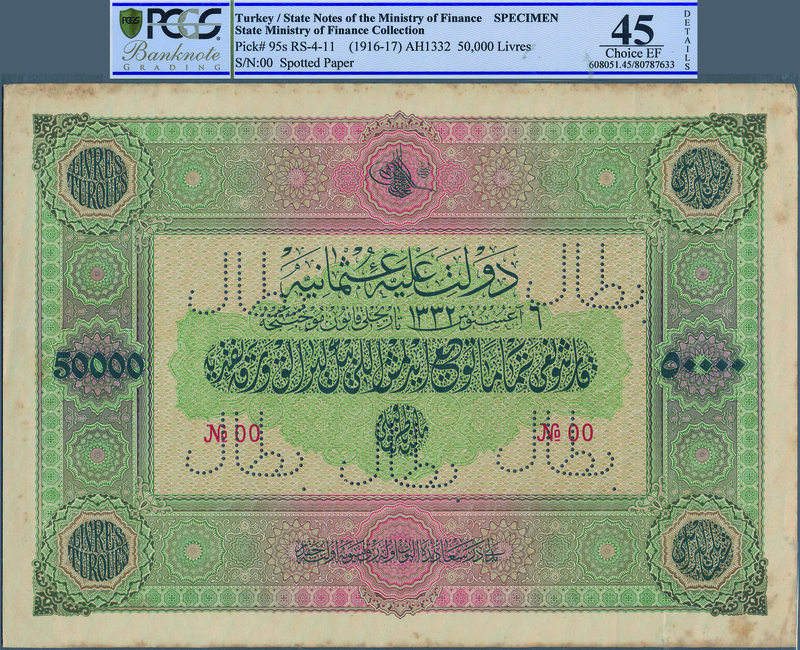 2461 Pick 90s 1 Livre ND(1916) Specimen P. 90s with zero serial numbers and specimen perforation in condition: PCGS graded 62 UNC. 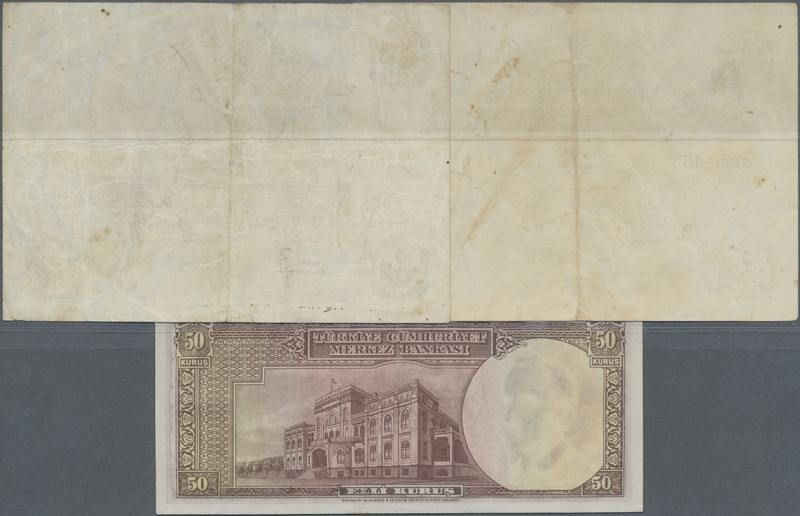 2466 Pick 99as 1 Livre ND(1917) Specimen P. 99as, rare note with zero serial numbers and specimen perforation in condition: PCGS graded 64 Choice UNC. 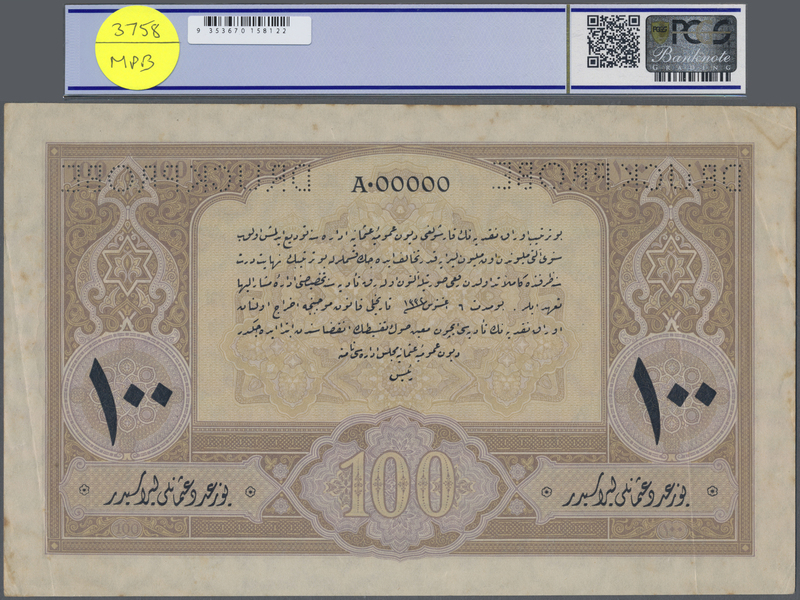 2468 Pick 100s 2 1/2 Livres ND(1916-17) Specimen P. 100s, rare note with zero serial numbers and specimen perforation in condition: PCGS graded 64 Choice UNC. 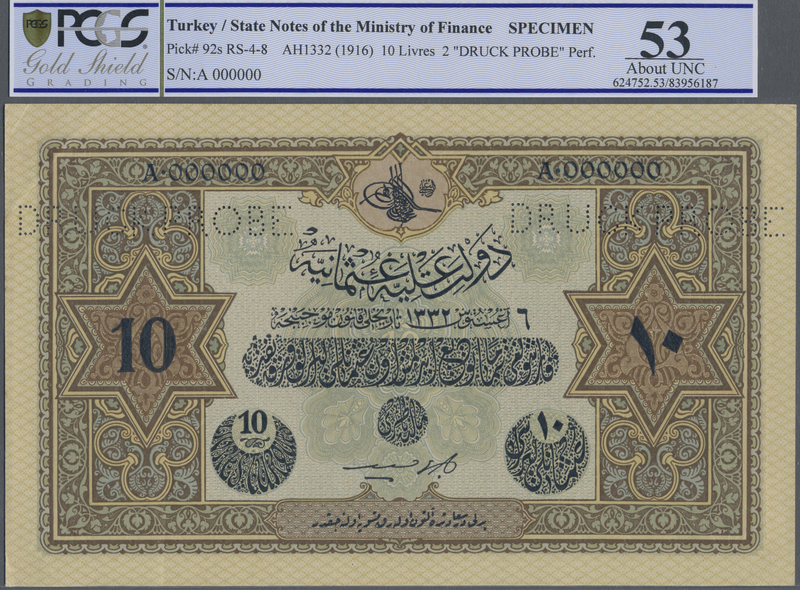 2469 Pick 104s 5 Livres ND(1917) Specimen P. 104s with zero serial numbers and specimen perforation, rare note in condition: PCGS graded 64 Choice UNC. 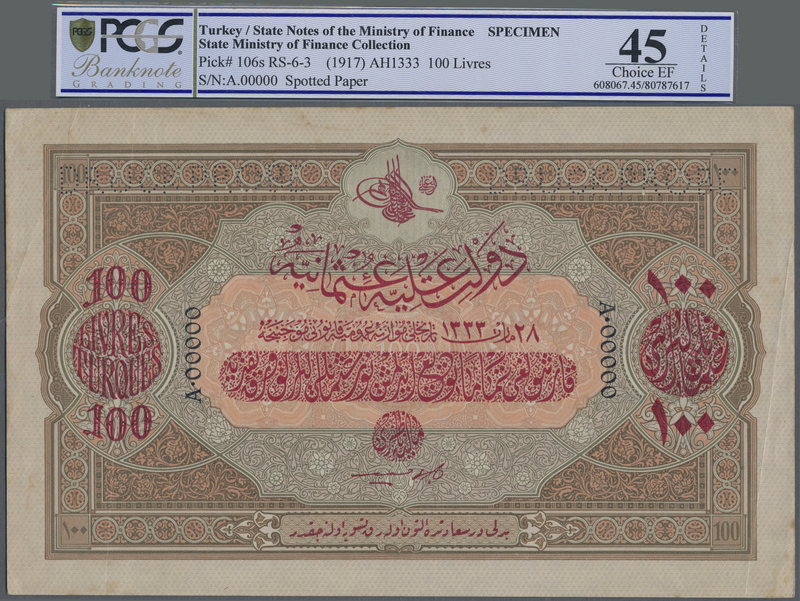 2470 Pick 106s 100 Livres ND(1917) Specimen P. 106s with zero serial numbers and Specimen perforation in condition: PCGS graded 45 Choice EF.